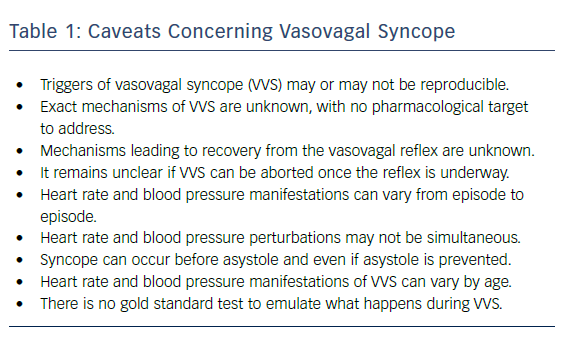 Vasovagal syncope (VVS) is due to a common autonomic reflex involving the cardiovascular system. It is associated with bradycardia (cardioinhibitory response) and/or hypotension (vasodepressor response), likely mediated by parasympathetic activation and sympathetic inhibition. While generally a situational, isolated and/or self-limited event, for some, VVS is recurrent, unpredictable and debilitating. Conservative, non-pharmacological management may help, but no specific medical therapy has been proven widely effective. Permanent pacing may have specific benefit, but its value has been debated. The temporal causative association of bradycardia with syncope in those with VVS may help identify which patient could benefit from pacing but the timing and type of pacing in lieu of blood pressure changes may be critical. 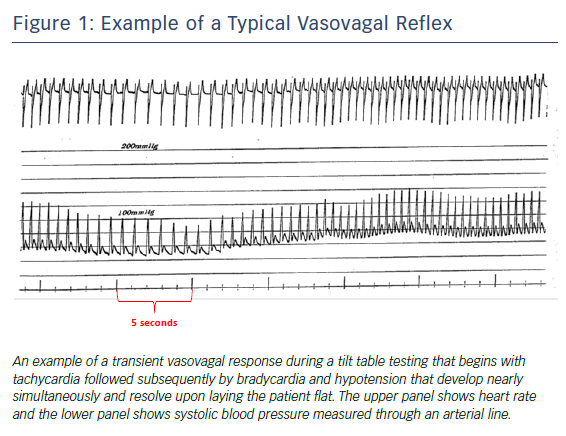 The mode, rate, pacing algorithm and time to initiate dual-chamber pacing preferentially with respect to the vasovagal reflex may be important to prevent or ameliorate the faint but completely convincing data are not yet available. Based on available data, DDD pacing with the closed loop stimulation algorithm appears a viable, if not the best, alternative presently to prevent recurrent VVS episodes. While several knowledge gaps remain, permanent pacing appears to have a role in managing select patients with VVS. Rakesh Gopinathannair has received consultant/speaker fees from Abbott, the American Heart Association, Pfizer, Bristol Myers Squibb and Zoll, and is on the advisory board of HealthTrust PG. Brian Olshansky has received consultant/speaker fees from Amarin Corporation, Boehringer Ingelheim, Cryolife and Lundbeck. Benjamin Salgado has no conflicts of interest to declare. Arrhythmia & Electrophysiology Review 2018;7(2):95–102. Heart rate and blood pressure are tightly regulated by autonomic control to effect adequate blood flow as needed. This regulatory process breaks down when the vasovagal reflex is activated. Profound, but brief, circulatory collapse manifests as bradycardia (cardioinhibitory response) and/or hypotension (vasodepressor response) and/or altered cerebral autoregulation, resulting in transient loss of consciousness, often with prodromal signs and symptoms (pallor, sweating and nausea) and profound fatigue and nausea during recovery.1,2 This complex neurocardiogenic reflex presents with a wide range of clinical scenarios, from isolated, sporadic, easily explained episodes, to frequent, recurrent and baffling events that, while not usually life-threatening, can be devastating.3,4 Vasovagal syncope (VVS) in otherwise healthy individuals is the most common cause for syncope.5,6 The vasovagal reflex is often responsible for syncope in other conditions as well, such as pulmonary emboli, aortic stenosis, hypertrophic cardiomyopathy, inferior myocardial infarction, gastrointestinal bleeding and dehydration. One postulated initiating factor is transient, excess, time-dependent, sympathetic activation, causing increased ventricular contractility, subsequent mechanoreceptor activation, initiating vagal (atrial and/or ventricular C fibre) afferent activation that is epinephrine dependent and the subsequent reflex.20 However, for those who are susceptible, triggers include prolonged standing, pain, psychological or emotional stressors, noxious stimuli or, simply, nothing at all.21–23 The reflex may be manifest in many ways and no individual necessarily has a unique footprint of their physiological perturbations. While most episodes of VVS are self-limiting, for some, the problem can be recurrent and devastating. Multiple non-pharmacological approaches may modulate the vasovagal response. Adequate hydration, avoidance of triggering events (e.g. donating blood) and physical counter-pressure manoeuvres during an event have been advocated,26,27 yet, no robust data point to any benefit of these recommendations or any effective pharmacological approach. This is not surprising, since the reflex is abrupt and transient and so any tonic intervention would not necessarily prevent an occasional autonomic destabilisation and may in fact worsen episodes if the autonomic nervous system otherwise becomes unbalanced.28 Pacing has been postulated to be effective as it can prevent severe bradycardia and asystole. Here, we explore the data on the use of pacing to prevent recurrent VVS. Recently, Saal et al. used video recordings, electroencephalography, and blood pressure and heart rate measurements to assess the relationship of bradycardia and hypotension to loss of consciousness during a vasovagal faint. Asystole occurred after the faint began in one-third of cases, making it unlikely to be the primary cause of syncope, and suggesting that bradycardia monitoring alone may overestimate which patients with VVS actually passed out from asystole31 (Figure 2). 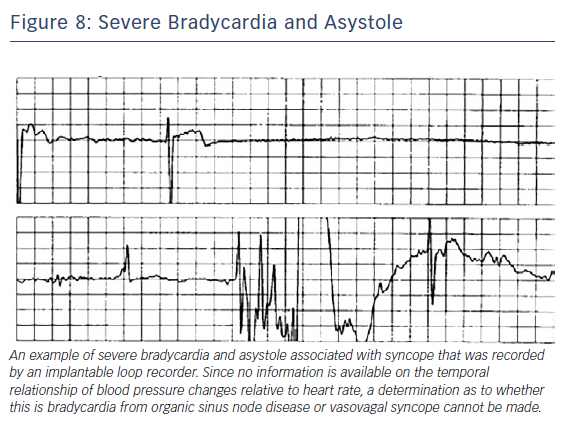 The incidence and extent of bradycardia, presumably related to a vasovagal reflex, but as a cause for syncope, may be age-dependent and confusing. While the incidence of bradycardia and asystole due to the vasovagal reflex may not vary by age as determined by tilt table testing,32,33 bradycardia in older patients may present due to concomitant underlying sinus node dysfunction. Older patients have different mechanisms at play that lead to hypotension and reduced cardiac output compared with younger ones.6,7 Reliance on rhythm monitoring to decide upon the utility of pacing in VVS may thus be misguided in some patients.24. However, given no clearly effective drug or drug combination,34,35 the association of episodes with bradycardia or asystole naturally makes one consider permanent pacing for selected individuals including those who are young (Figure 3). In this manuscript, we provide a critical review of the role of permanent cardiac pacing for VVS. Although it may seem straightforward that pacing can help patients with syncope and bradycardia, cardiac pacing has a limited role in managing VVS. It is more than just the fact that data conflict regarding benefit of pacing to prevent syncope recurrence.40 Pacing may not effectively counteract vasodilatation, but may modulate hypotension if fast enough. It is important to know the frequency of recurrent VVS and also the need for future intervention. Those with VVS and documented asystole during tilt-table testing do not necessarily require any intervention. Carvalho et al. performed 2,263 consecutive tilt-table tests (utilising isosorbide dinitrate) in 2,247 patients with syncope finding that 149 had asystole (mean 10 seconds); 11 had asystole for ≥30 seconds with one episode lasting 63 seconds.41 Despite no pacemaker implant and with generally conservative management, after a median of 42 months of follow-up, four had syncope and only one had syncope-related injury, suggesting that pacing is not required for all individuals even if they have asystole on the tilt-table test41 (Figure 5). Nevertheless, there are those who continue to collapse without warning and with asystole, for whom a pacemaker may prevent or reduce the frequency or severity of episodes (Figure 3). The North American Vasovagal Pacemaker Study (VPS I) randomised patients with three or more episodes of syncope and a positive tilt-table test (hypotension and relative bradycardia) to dual chamber pacing (lower rate of 60 BPM with rate-drop response) versus no pacemaker. 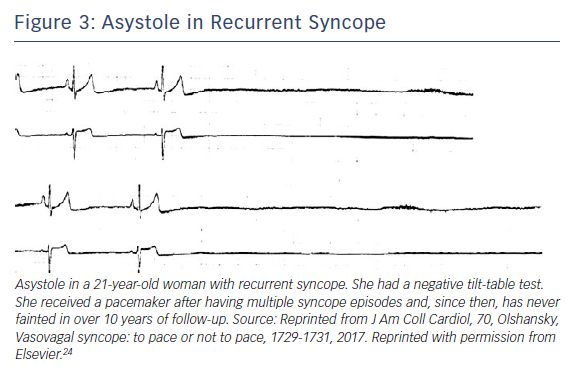 Subsequent syncope occurred in 70 % with no pacemaker but only 22 % in the pacemaker group, a stunning 85 % reduction (CI [59.7–94.7 %]; p=0.00002). The mean time from randomisation to syncope was 54 days in the no-pacemaker group and 112 days in the pacemaker group.37 Since this study was not blinded, a placebo response to pacing could not be ruled out. Similarly, Ammirati et al. performed a multicentre, randomised study of dual-chamber pacing with rate-drop response versus atenolol in patients ≥35 years who had three or more syncopal episodes in the preceding 2 years and positive tilt-table test showing relative bradycardia [Syncope Diagnosis and Treatment (SYDIT) study].48 There was a 4.3 % recurrence of syncope after a median of 390 days in the pacemaker group versus 25.5 % after median of 135 days in the atenolol group (OR 0.133; 95 % CI [0.028–0.632], p=0.004). Again, a placebo response to pacing could not be excluded. 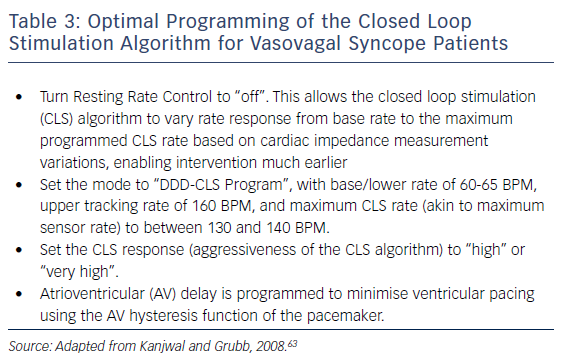 Until recently, rate-drop response was the most commonly studied algorithm for VVS,36,37,48,49,51 but pacing support, even at faster rates, may be too little and too late to counteract reflex vasodilation.37 Recent evidence points to the use of closed loop simulation (CLS) to initiate pacing at an earlier stage.24,53–59 CLS is a proprietary Biotronik algorithm, purported to measure intracardiac impedance during systole for each beat, but it actually measures local impedance in the right ventricle, which may relate to contractility. Influencing impedance is right ventricular volume. Based on this, the algorithm adjusts pacing rate dependent upon changes in measured impedance, such as may be noted early in the onset of a vasovagal event.55,60 How best to program the CLS algorithm to allow intervention early on in a vasovagal reflex, and thereby prevent the faint, is detailed in Table 3. The SPAIN (Closed Loop Stimulation for Neuromediated Syncope) trial, a recent, randomised, double-blinded, crossover study, enrolled patients ≥ 40 years old with high burden of syncope (five or more episodes or two or more episodes in the past year) and a cardioinhibitory response to tilt-table testing (bradycardia <40 BPM for 10 seconds or asystole >3 seconds). Patients were randomised to DDD-CLS versus sham DDI pacing (30 pulse/minute subthreshold) and crossed over at 12 months or when a maximum of three syncopal episodes occurred within 1 month. The proportion with ≥50 % reduction in syncopal episodes was 72 % (95 % CI [47–90 %]) with DDD-CLS versus 28 % (95 % CI [9.7–53.5 %]) with sham DDI mode (p=0.017). Overall, four patients in the CLS group passed out versus 21 in the DDI group. There was substantial improvement in time to first syncope in the CLS group (29 months versus 9 months; OR 11; p<0.0001). Following crossover, marked reductions in events were seen with DDD-CLS pacing in both groups. CLS resulted in a 37 % absolute risk reduction in time to first syncope (number needed to treat to prevent one syncopal episode was 2.7).59 Detecting changes in cardiac impedance measurements early using the CLS algorithm might provide prompt and aggressive heart rate support to prevent relative bradycardia or asystole and may modulate hypotension enough to prevent syncope. Thus, DDD-CLS pacing has been shown to be effective in a double-blinded trial. To keep this in perspective, ISSUE-3, also double-blinded, showed statistically significant benefit for pacing versus sensing only modes. Additionally, the prospective, multicentre, observational Syncope Unit Project 2 (SUP-2) study validated a standardised guideline-based algorithm to select those for pacing.52,61 In this study, patients age >40 years with severe unpredictable recurrent reflex syncope having evidence for an asystolic response underwent dual-chamber pacing (often with a rate drop feature). Of 281 patients meeting inclusion, 137 received a pacemaker. At 3 years, the actuarial syncope recurrence rate was 20 % (95 % CI [12–30]), lower than those monitored by an implantable loop recorder (43 %, 95 % CI [29–57]; p=0.01). In our clinical experience, DDD pacing with rate-drop response, with or without additional medical therapy, can be effective as well. The fact that pacing can be effective in some patients with syncope does not mean that it is required for all patients. Moreover, even in patients with episodic asystole that is directly temporally related to the event itself and even if it is not associated with hypotension, pacing might still not be indicated (Figure 7). Since vasovagal episodes are common, pacing needs to be directed at the subset of patients who have recurrent episodes for whom pacing will abort the episode(s). This may include older (>40 years) individuals as well as those who experience frequent recurrences, debilitating consequence, repeated injury, limited prodrome and documented asystole.34 There is no specific reason a pacemaker would not be effective in an individual younger than 40 years, but careful consideration for an implant in a young patient is required. The 2018 ESC Guidelines for the Diagnosis and Management of Syncope consider pacing is reasonable for patients over 40 years old with spontaneous documented symptomatic asystolic pauses >3 seconds or asymptomatic pauses >6 seconds due to sinus arrest, AV block or a combination (Class IIa, LOE B).26 These guidelines also recommend that pacing may be considered to reduce syncope recurrences in patients with tilt-induced asystolic response who are >40 years with recurrent frequent unpredictable syncope (Class IIb, LOE B), but advises against pacing in the absence of a cardioinhibitory response. Similarly, the 2015 HRS Expert Consensus Statement gives a Class IIa (LOE B-R) indication for pacing in patients >40 years with recurrent, unpredictable syncope and a documented pause >3 seconds during clinical syncope or an asymptomatic pause >6 seconds.65 Pacing has a Class IIb, LOE B-R recommendation for paediatric patients with recurrent syncope with documented symptomatic asystole refractory to medical therapy. The 2017 Systematic Review for ACC/AHA/HRS Guidelines concluded that the current evidence does not support pacing for patients with recurrent VVS and asystole.40 However, establishing a relationship between symptoms and severe bradycardia is essential before considering permanent pacing. This is easier said than done, as the role of hypotension in the reflex sequence complicates the picture. Prolonged ECG monitoring, usually by an ILR, may be useful,34 but still the mechanism of syncope could be due to hypotension. Older patients have a higher likelihood of sick sinus syndrome and consequent bradycardia rather than VVS and the two can be difficult to distinguish. Bradycardia recorded from a loop recorder could be problematic, as no information is available on temporal relationship of blood pressure changes relative to heart rate (Figure 8). 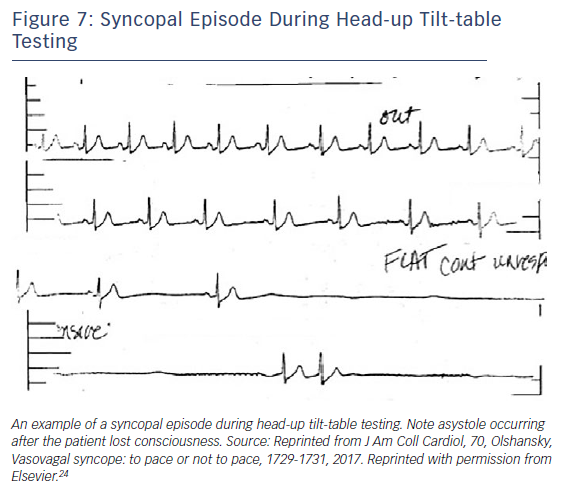 Asystole on a tilt-table test, however, may not be a sensitive or specific indication of spontaneous asystole or the need for pacing but recurrent, frequent and severe VVS episodes could justify implanting a pacemaker. Young patients with VVS and asystole may have a specific trigger, may have rare episodes of syncope and may not benefit from pacing therapy. Thus, caution is advised with use of long-term pacing in individuals younger than 40 years, especially since living with a pacemaker at a young age can be difficult and can lead to long-term complications. However, younger patients with frequent, debilitating, recurrent asystolic vasovagal syncope unresponsive to any other therapy or unable to be treated in any other way may indeed be candidates for pacing. Radiofrequency ablation of ganglionic plexi in the right atrium, near the superior vena cava and sinus node, inferior vena cava, near the coronary sinus and AV node, and in the left atrium near the floor and near all four pulmonary veins with the aim of abolishing vagal efferent activation during VVS (cardioneuroablation) has shown promise in early observational studies,69-71 but larger, controlled studies with long-term follow-up are needed to confirm the safety and efficacy of this procedure. What is the mechanism responsible for VVS and how can it be best counteracted? Is there a way to abort an episode of VVS before it goes to completion? Is pacing useful for those under the age of 40 years with recurrent VVS associated with severe bradycardia and/or asystole? Is there a role for concomitant medical therapy with pacing for VVS patients? Why does the reflex reset itself after a few seconds, and how? Which patients with VVS over 40 years of age require and benefit from pacing? Does tilt-table testing combined with ILR monitoring provide better insights into identifying the best candidates for pacing in VVS? 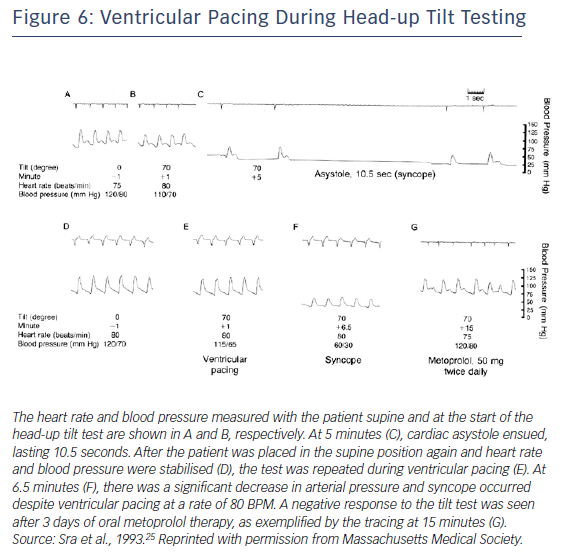 Is tilt-table testing required to evaluate the need for pacing in VVS? Can pacing algorithms other than CLS benefit select patient subsets? How is it best to programme the pacemaker? VVS is a common problem due to a ubiquitous, counterintuitive reflex. Initiating factors may affect sympathetic activation. While most patients can be managed conservatively without the need for specific medical interventions, emerging evidence indicates that pacing may reduce recurrent syncope for select patients, especially if episodes are frequent, recurrent and otherwise difficult to manage. The pacing algorithm, rate, type and timing of pacing, with respect to onset of the reflex, may be critical to prevent fainting. Pacing should be considered especially if syncope occurs concomitant with a cardioinhibitory response. Tilt-table testing may help quantify the heart rate and blood pressure responses temporally associated with vasovagal syncope. By detecting local impedance in the right ventricle which may relate to contractility, CLS may assess autonomic function and improve the timing for onset of pacing. DDD pacing with rate response gauged by the CLS algorithm appears to be the current best alternative to detect the need for pacing and prevent recurrent episodes in VVS. However, compelling data also support the use of pacing with rate-drop response for patients selected by the presence of asystolic episodes. Lewis T. A Lecture on vasovagal syncope and the carotid sinus mechanism. BMJ 1932;1:873-6. Brignole M, Alboni P, Benditt DG, et al. Guidelines on management (diagnosis and treatment) of syncope-update 2004. Eur Heart J 2004;25:2054-72. Moya A. Tilt testing and neurally mediated syncope: too many protocols for one condition or specific protocols for different situations? Eur Heart J 2009;30:2174-6. Linzer M, Pontinen M, Gold DT, et al. Impairment of physical and psychosocial function in recurrent syncope. J Clin Epidemiol 1991;44:1037-43. Soteriades ES, Evans JC, Larson MG, et al. Incidence and prognosis of syncope. N Engl J Med 2002;347:878-85. Colman N, Nahm K, Ganzeboom KS, et al. Epidemiology of reflex syncope. Clin Auton Res 2004;14(Suppl 1):9-17. Jardine DL, Wieling W, Brignole M, et al. Pathophysiology of the vasovagal response. Heart Rhythm 2017.epub ahead of press. Olshansky B. Vagus nerve modulation of inflammation: Cardiovascular implications. Trends Cardiovasc Med 2016;26:1-11. Morillo CA, Eckberg DL, Ellenbogen KA, et al. 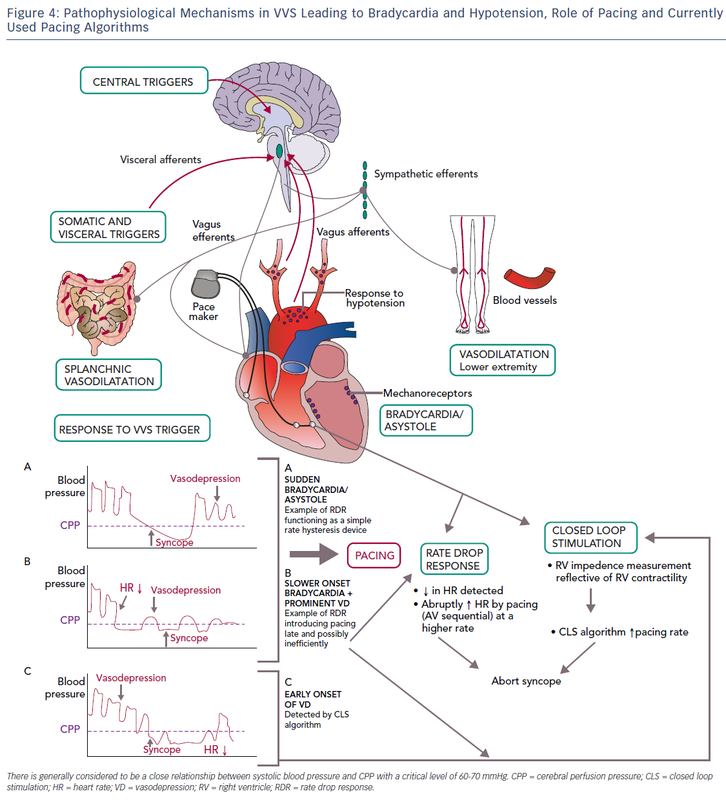 Vagal and sympathetic mechanisms in patients with orthostatic vasovagal syncope. Circulation 1997;96:2509-13. Wieling W, Jardine DL, de Lange FJ, et al. Cardiac output and vasodilation in the vasovagal response: An analysis of the classic papers. Heart Rhythm 2016;13:798-805. Dietz NM, Halliwill JR, Spielmann JM, et al. 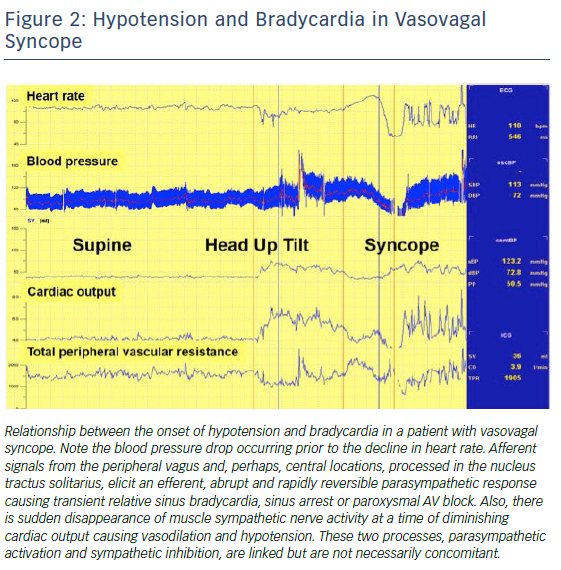 Sympathetic withdrawal and forearm vasodilation during vasovagal syncope in humans. J Appl Physiol (1985) 1997;82:1785-93. Jardine DL, Ikram H, Frampton CM, et al. Autonomic control of vasovagal syncope. Am J Physiol 1998;274:H2110–5. Li H, Liao Y, Han Z, et al. Head-up tilt test provokes dynamic alterations in total peripheral resistance and cardiac output in children with vasovagal syncope. Acta Paediatr 2018; Mar 30.epub ahead of press. Verheyden B, Liu J, van Dijk N, et al. Steep fall in cardiac output is main determinant of hypotension during drug-free and nitroglycerine-induced orthostatic vasovagal syncope. Heart Rhythm 2008;5:1695-701. Carey BJ, Manktelow BN, Panerai RB, Potter JF. Cerebral autoregulatory responses to head-up tilt in normal subjects and patients with recurrent vasovagal syncope. Circulation 2001;104:898-902. Ellenbogen KA, Morillo CA, Wood MA, et al. Neural monitoring of vasovagal syncope. Pacing Clin Electrophysiol 1997;20:788-94. Stewart JM, Suggs M, Merchant S, et al. Postsynaptic alpha1-adrenergic vasoconstriction is impaired in young patients with vasovagal syncope and is corrected by nitric oxide synthase inhibition. Circ Arrhythm Electrophysiol 2016;9:pii: e003828. Mitro P, Habalova V, Evin L, et al. Gene polymorphism of the adenosine A2a receptor in patients with vasovagal syncope. Pacing Clin Electrophysiol 2016;39:330-7. Shen WK, Hammill SC, Munger TM, et al. Adenosine: potential modulator for vasovagal syncope. J Am Coll Cardiol 1996;28:146-54. Abboud FM, Heistad DD, Mark AL, Schmid PG. Reflex control of the peripheral circulation. Prog Cardiovasc Dis 1976;18:371-403. Alhuzaimi A, Aljohar A, Alhadi AN, et al. Psychiatric traits in patients with vasovagal and unexplained syncope. Int J Gen Med 2018;11:99-104. Viar MA, Etzel EN, Ciesielski BG, Olatunji BO. Disgust, anxiety, and vasovagal syncope sensations: a comparison of injection-fearful and nonfearful blood donors. J Anxiety Disord 2010;24:941-5. Owens AP, Low DA, Critchley HD, Mathias CJ. Emotional orienting during interoceptive threat in orthostatic intolerance. Auton Neurosci 2018.epub ahead of press. 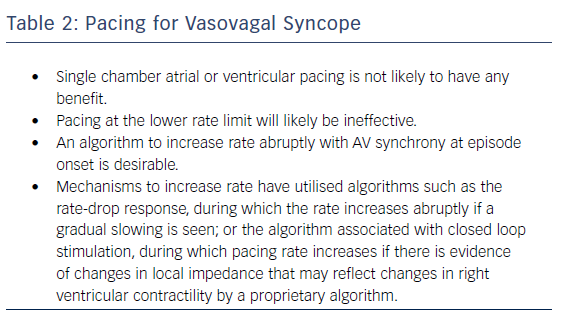 Olshansky B. Vasovagal syncope: to pace or not to pace. J Am Coll Cardiol 2017;70:1729-1731. Sra JS, Jazayeri MR, Avitall B, et al. Comparison of cardiac pacing with drug therapy in the treatment of neurocardiogenic (vasovagal) syncope with bradycardia or asystole. N Engl J Med 1993;328:1085-90. Shen WK, Sheldon RS, Benditt DG, et al. 2017 ACC/AHA/HRS guideline for the evaluation and management of patients with syncope: executive summary. J Am Coll Cardiol 2017;70:620-63. Brignole M, Moya A, de Lange FJ, et al. 2018 ESC Guidelines for the diagnosis and management of syncope. Eur Heart J 2018.epub ahead of press. Thijs RD, Wieling W, van Dijk JG. Status vasovagalis. Lancet 2009;373:2222. Guida P, Iacoviello M, Forleo C, et al. Prevalence, timing, and haemodynamic correlates of prodromes in patients with vasovagal syncope induced by head-up tilt test. Europace 2009;11:1221-6. Brignole M, Sutton R, Menozzi C, et al. Lack of correlation between the responses to tilt testing and adenosine triphosphate test and the mechanism of spontaneous neurally mediated syncope. Eur Heart J 2006;27:2232-9. Saal DP, Thijs RD, van Zwet EW, et al. Temporal relationship of asystole to onset of transient loss of consciousness in tilt-induced reflex syncope. JAAC: Clinical Electrophysiology 2017;3:1592–8. Barón-Esquivias G, Pedrote A, Cayuela A, et al. Long-term outcome of patients with asystole induced by head-up tilt test. Eur Heart J 2002;23:483-9. Barón-Esquivias G, Cayuela A, Pedrote A, et al. [Clinical characteristics and head-up tilt test results with three protocols in 1661 patients with syncope]. Rev Esp Cardiol 2003;56:916-20 [in Spanish]. Shen WK, Sheldon RS, Benditt DG, et al. 2017 ACC/AHA/HRS guideline for the evaluation and management of patients with syncope. Circulation. 2017;136:e25-e59. Vyas A, Swaminathan PD, Zimmerman MB, Olshansky B. Are treatments for vasovagal syncope effective? A meta-analysis. Int J Cardiol 2013;167:1906-11. Connolly SJ, Sheldon R, Thorpe KE, et al. Pacemaker therapy for prevention of syncope in patients with recurrent severe vasovagal syncope. JAMA 2003;289:2224-9. Connolly SJ, Sheldon R, Roberts RS, Gent M. The North American Vasovagal Pacemaker Study (VPS). A randomized trial of permanent cardiac pacing for the prevention of vasovagal syncope. J Am Coll Cardiol 1999;33:16–20. Krahn AD, Klein GJ, Yee R,Norris C. Final results from a pilot study with an implantable loop recorder to determine the etiology of syncope in patients with negative noninvasive and invasive testing. Am J Cardiol 1998;82:117-9. Abi-Samra FM, Singh N, Rosin BL, et al. Effect of rate-adaptive pacing on performance and physiological parameters during activities of daily living in the elderly. Europace 2013;15:849-56. Varosy PD, Chen LY, Miller AL, et al. Pacing as a treatment for reflex-mediated (vasovagal, situational, or carotid sinus hypersensitivity) syncope. Circulation 2017;136:e123–35. Carvalho MS, Reis Santos K, Carmo P, et al. Prognostic value of a very prolonged asystole during head-up tilt test. Pacing Clin Electrophysiol 2015;38:973-9. Fitzpatrick A, Theodorakis G, Ahmed R, et al. Dual chamber pacing aborts vasovagal syncope induced by head-up 60 degrees tilt. Pacing Clin Electrophysiol 1991;14:13-9. Petersen ME, Chamberlain-Webber R, Fitzpatrick AP, et al. Permanent pacing for cardioinhibitory malignant vasovagal syndrome. Br Heart J 1994;71:274-81. Benditt DG, Petersen M, Lurie KG, et al. Cardiac pacing for prevention of recurrent vasovagal syncope. Ann Intern Med 1995;122:204-9. Benditt DG, Sutton R, Gammage M, et al. “Rate-drop response” cardiac pacing for vasovagal syncope. J Interv Card Electrophysiol 1999;3:27-33. Benditt DG, Sutton R, Gammage MD, et al. Clinical experience with Thera DR rate-drop response pacing algorithm in carotid sinus syndrome and vasovagal syncope. Pacing Clin Electrophysiol 1997;20:832-9. Sutton R, Brignole M, Menozzi C, et al. Dual-chamber pacing in the treatment of neurally mediated tilt-positive cardioinhibitory syncope : pacemaker versus no therapy. Circulation 2000;102:294-9. Ammirati F, Colivicchi F, Santini M, et al. Permanent cardiac pacing versus medical treatment for the prevention of recurrent vasovagal syncope:. Circulation 2001;104:52-7. Raviele A, Giada F, Menozzi C, et al. A randomized, double-blind, placebo-controlled study of permanent cardiac pacing for the treatment of recurrent tilt-induced vasovagal syncope. Eur Heart J 2004;25:1741-8. Brignole M, Sutton R, Wieling W, et al. Analysis of rhythm variation during spontaneous cardioinhibitory neurally-mediated syncope. Europace 2007;9:305-11. Brignole M, Menozzi C, Moya A, et al. Pacemaker therapy in patients with neurally mediated syncope and documented asystole. Circulation 2012;125:2566-71. Brignole M, Ammirati F, Arabia F, et al. Assessment of a standardized algorithm for cardiac pacing in older patients affected by severe unpredictable reflex syncopes. Eur Heart J 2015;36:1529-35. Kanjwal K, Karabin B, Kanjwal Y, Grubb BP. Preliminary observations on the use of closed-loop cardiac pacing in patients with refractory neurocardiogenic syncope. J Interv Card Electrophysiol 2010;27:69-73. Bortnik M, Occhetta E, Dell’Era G, et al. Long-term follow-up of DDDR closed-loop cardiac pacing for the prevention of recurrent vasovagal syncope. J Cardiovasc Med (Hagerstown) 2012;13:242-5. Occhetta E, Bortnik M, Audoglio R, et al. Closed loop stimulation in prevention of vasovagal syncope. Europace 2004;6:538-47. Palmisano P, Zaccaria M, Luzzi G, et al. Closed-loop cardiac pacing vs. conventional dual-chamber pacing with specialized sensing and pacing algorithms for syncope prevention in patients with refractory vasovagal syncope. Europace 2012;14:1038-43. Palmisano P, Dell’Era G, Russo V, et al. Effects of closed-loop stimulation vs. DDD pacing on haemodynamic variations and occurrence of syncope induced by head-up tilt test in older patients with refractory cardioinhibitory vasovagal syncope. Europace 2017.epub ahead of press . Russo V, Rago A, Papa AA, et al. The effect of dual-chamber closed-loop stimulation on syncope recurrence in healthy patients with tilt-induced vasovagal cardioinhibitory syncope. Heart 2013;99:1609-13. Barón-Esquivias G, Morillo CA, Moya-Mitjans A, et al. 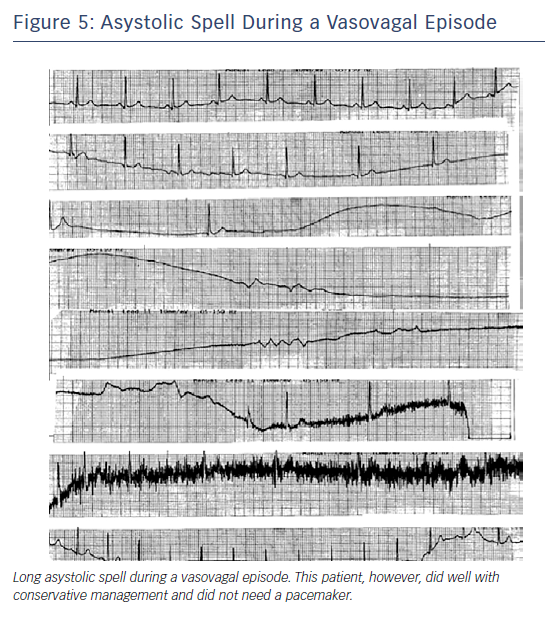 Dual-chamber pacing with closed loop stimulation in recurrent reflex vasovagal syncope. J Am Coll Cardiol 2017;70:1720–8. Kanjwal K, Grubb BP. Observations on optimal programming of closed loop cardiac pacemakers in patients with refractory neurocardiogenic syncope. Journal of Innovations in Cardiac Rhythm Management 2011;2:395-9. Brignole M, Arabia F, Ammirati F, et al. Standardized algorithm for cardiac pacing in older patients affected by severe unpredictable reflex syncope. Europace 2016;18:1427-33. Brignole M, Tomaino M, Aerts A, et al. Benefit of dual-chamber pacing with closed loop stimulation in tilt-induced cardio-inhibitory reflex syncope (BIOSync trial): study protocol for a randomized controlled trial. Trials 2017;18:208. Epstein AE, DiMarco JP, Ellenbogen KA, et al. ACC/AHA/HRS 2008 guidelines for device-based therapy of cardiac rhythm abnormalities. Circulation 2008;117:e350-408. Romme JJ, Reitsma JB, Black CN, et al. Drugs and pacemakers for vasovagal, carotid sinus and situational syncope. Cochrane Database Syst Rev 2011: CD004194. Sheldon RS, Grubb BP 2nd, Olshansky B, et al. 2015 Heart Rhythm Society expert consensus statement on the diagnosis and treatment of postural tachycardia syndrome, inappropriate sinus tachycardia, and vasovagal syncope. Heart Rhythm 2015;12:e41–63. Moya A, Sutton R, Ammirati F, et al. Guidelines for the diagnosis and management of syncope (version 2009). Eur Heart J 2009;30:2631-71. Brignole M, Deharo JC, De Roy L, et al. Syncope due to idiopathic paroxysmal atrioventricular block. J Am Coll Cardiol 2011;58:167-73. Aste M, Brignole M. Syncope and paroxysmal atrioventricular block. J Arrhythm 2017;33:562-567. Pachon JC, Pachon EI, Cunha Pachon MZ, et al. Catheter ablation of severe neurally meditated reflex (neurocardiogenic or vasovagal) syncope. Europace 2011;13:1231–42. Aksu T, Guler TE, Bozyel S, et al. Cardioneuroablation in the treatment of neurally mediated reflex syncope: a review of the current literature. Turk Kardiyol Dern Ars 2017;45:33-41. Yao Y, Shi R, Wong T, et al. Endocardial autonomic denervation of the left atrium to treat vasovagal syncope: an early experience in humans. Circ Arrhythm Electrophysiol 2012;5:279-86.